This week, I shut out all the lights, dragged out my blankie and favourite pillow and plopped myself on the couch to check out Stranger Things (2016), the latest (and possibly greatest) TV series from Netflix. Stranger Things tells the scary tale of young Will Byers' disappearance in the small town of Hawkins, Illinois, and one mother's insistence that he's still alive. To complicate matters, a young girl with the dubious name "Eleven" shows up out of the blue, barely able to speak but possessing some remarkable abilities. 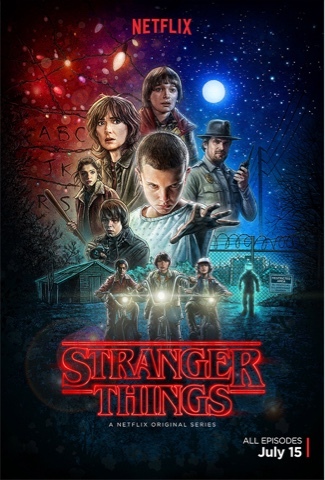 Throw in a trio of adventurous boys (who adopt Eleven) a shadowy government operation, a healthy dose of teen angst and set it all dancing to the tune of the supernatural, and you'll start to get an idea of what Stranger Things is all about. I should warn you, before you read any further, there will be spoilers. The performances on the show are, for the most part, superb. Millie Bobby Brown especially, who plays the enigmatic Eleven, is such a treat to watch you'll be inpatient for scenes she's not in to finish up quicker. The story moves along at a decent pace, giving bits and pieces of the mystery throughout and moving the main plot along while attempting to build some character development. In fact, some of the side plots used to fill time and flesh out the characters are my only real complaint with the show. It's established pretty early that Will's absentee father is a douchebag. I don't think we need more scenes dedicated to this later on. Will's sister Nancy and all her teenage trials and tribulations seems to drag on forever before finally bringing her into the main story. Her interactions with the supernatural side of things are important to the story, the rest of it plays out like a series on the CW. A bad one. Her boyfriend Steve's redemption towards the end of the series doesn't work at all. They spent too much time wanting us to dislike him and gave little motivation for why he'd suddenly turn out to be a great guy after all. Still, the overall look, tone and feel works so well you'll assume you're watching a long movie and not a tv series. I've heard and read some people drawing comparisons to Spielberg. Other than the obvious parallels between Eleven and E.T., I don't get the feel of a Spielberg picture at all. For me, it's like John Carpenter worked closely with Stephen King and came up with a series centred on...wait for it...stranger things happening to characters we've come to know and love. Even the ending screams of King and Carpenter, with a little Twin Peaks thrown in for good measure. At only 8 episodes, this could be the best weekend binge watching series ever produced. I cannot recommend it highly enough.